After my 100th post, I rewarded myself by buying a few graphic novels from the used book store. I bought three; all three were books that I had let others borrow, and that I never got back. In the case of We3, it is the third copy that I have owned, and I will not be letting this copy out of my house…unless you want to borrow it because it’s brilliant. 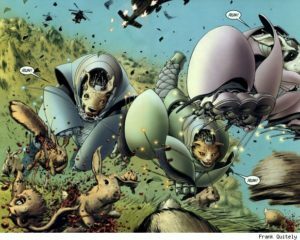 We3 is a short tale that tells the story of a government that takes what we are allowed to believe to be three strays (a dog, a cat, and a rabbit), and makes them into robotic war machines of destruction with rudimentary language abilities. When the dog asks if “Dog gud?” you will lose your stuff. 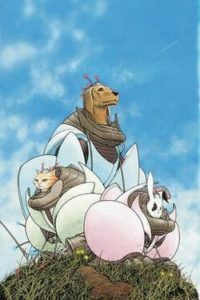 It’s short, so I do not want to give too much away, but here’s the basic plot: the We3 program is being decommissioned, and the three animals are to be put down, but a rogue scientist, caring for the three, releases them, and all hell breaks loose. These animals are programmed to survive by any means necessary, and they are fully equipped with an arsenal. The book deals with the themes of humanity, cruelty, hope, love, bravery, and friendship…along with a number of others. As the animals fight for their survival, you watch every brutal second as the government that created them tosses every available resource at them to take them down. And the art holds nothing back. Frank Quitely is a genius, and next to Pride of Baghdad, this book might contain my second favorite art thus far. The action is created through a series of interestingly done pages/panels (see the mini-panels in the large one below), and perspectives not commonly done in the medium. Not for the faint of heart, this tale is brutal in its telling and art, but the ending has some payoff. Violence usually does not keep me from teaching a graphic novel in my classroom, but this one might. I’ll have to work up the courage with this one. I’d for sure recommend this one, and keep a copy on my shelf for the right kids, but damn it’s in your face brutality. Oh, yeah, and it’s another book that made me shed some tears.